We’re thrilled to announce that our Ethiopian Kossa Kebena coffee is a finalist in the 2019 Good Food Awards competition. This sustainably sourced coffee also took home a Good Food Award in 2017. We had the only Ohio entry among 25 finalists in the coffee category. “Crimson Cup is excited to be recognized once again among the country’s top coffee roasters in a competition that recognizes both excellence and sustainable sourcing,” said Founder and President Greg Ubert. The Good Food Awards celebrate tasty, authentic and responsible foods. Now in its ninth year, the competition includes entries in 16 categories: beer, charcuterie, cheese, chocolate, cider, coffee, confections, elixirs, fish, honey, oils, pantry, pickles, preserves, snacks and spirits. Award winners will be announced January 11, 2019 at the Good Food Awards ceremony in San Francisco. The 2019 finalists rose to the top in a blind tasting of 2,035 entries from 40 states. The 401 products chosen as finalists passed a rigorous vetting to confirm they met specific Good Food Awards standards around environmentally sound agriculture practices, sourcing transparency and responsible relationships throughout the supply chain. Organic Ethiopian Kossa Kebena is part of Crimson Cup’s Friend2Farmer line of direct-trade coffees. It is produced by the Kabena Kossa farm in Western Ethiopia’s Limmu Kossa District. A member of the Kossa Geshe co-op, the 1,000 hectare farm was established in 2009 as a land grant from Ethiopia’s investment agency to safeguard some of the last remaining dense forest in the country. “The farm grows heirloom variety coffee trees at an altitude of 5,000 to 6,200 feet, which are dry processed on raised beds,” said Brandon Bir, coffee sourcing and education director. He has visited the farm annually since 2016. Brandon noted that Western Ethiopia’s large Jimma region is one of its most diverse in regards to varieties and cup profiles. “While this diversity has led to a variety of opinion on coffees from Jimma, we have found that Western Ethiopia is a wonderful place to go hunting for gems,” he said. “We have found phenomenal farmers and exceptional coffees out of the Agaro, Limmu, and the Belete-Gera regions in particular. Crimson Cup developed our Friend2Farmer direct trade program to ensure that farmers receive a fair share of proceeds from coffee sales. The company pays a premium to farmers, who can then invest in agricultural and community improvements. Crimson Cup coffee experts also collaborate with farmers on ways to improve the quality of the coffee and quality of life for farmers, workers and their communities. 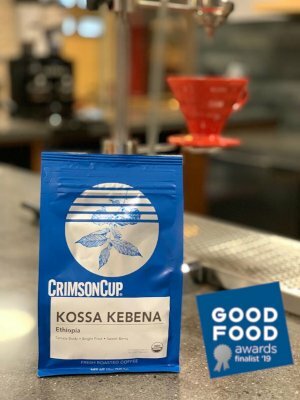 Ethiopian Kossa Kebena is available for a limited time at Crimson Cup Coffee Houses in Clintonville, Upper Arlington and Tallmadge, Ohio. Bags of fresh-roasted coffee can be purchased from the Crimson Cup website at a cost of $16.50 for 12 ounces.